The post-enlightenment epoch has been the wellspring of grand ambitions for the liberal and democratic states of the West. Seemingly unabated by the failures of Wilsonianism, the collapse of the League of Nations, or the Great Wars, the West did not cease its “restless search for a new way of securing order and peace.” Walter Lippmann, a New Republic intellectual, pronounced in 1915 that America had a stark choice before her, “[either] being the passive victim of international disorder [or] resolving to be an active leader in ending it.” Indeed, America would eventually proceed as the Don Quixote of international affairs, seemingly undoing wrongs and bringing justice to a world fraught with tyranny. However, deeply embedded within the fabric of American political life are conflicting traditions of political thought. Dean Acheson recalls the "national mind" of America in 1941 as the product of "two contrary and equally unrealistic ideas," namely isolationism and the desire for "universal law and internationally enforced peace." The latter force triumphed. Daniel Sargent, history professor at the University of California Berkeley, observes that America’s position, "supreme in military capabilities, serene in geopolitical security, and unrivaled in economic productivity" emboldened post-war leaders to discard isolationist warnings. America had taken a gamble and they were keen to collect their winnings. The United States took it upon itself to "remake the international order," with President Truman appealing to America’s divine right to rule "for the welfare of the world." Every post-war administration since Roosevelt has articulated a variant of this historical liberal internationalism; whether it be George H.W. Bush’s moderate internationalism or George W. Bush’s expansionary internationalism á la Wolfowitz. This article seeks to break with this tradition. By probing into the Jacksonian-Jeffersonian school of thought this article proposes a quintessentially American grand strategy. The article makes a daring claim: that realpolitik, the fine art of the European Old World that is poorly understood by the New, is in fact firmly rooted within the Jacksonian-Jeffersonian school of thought. Post-war US grand strategy was shaped most significantly by Hamiltonians and Wilsonianism. [8,9] Both of these schools of thought fundamentally believed in the establishment of a stable, liberal, rules-based world order. Yet a third tradition emerging out of rural communities, that of Jacksonianism, was less committed to the project of global order. For Jacksonians, American exceptionalism lay not in curing tyranny overseas, but rather, its "chief business lies at home," securing the life, liberty, and the pursuit of happiness of the American citizenry. Indeed, a thematic feature of both the Trump and Sanders campaigns of 2016 was a Jacksonian aura: the existing political system had failed to properly respond to a range of largely domestic insecurities that had arisen since the collapse of the Soviet Union. ...the liberal international order, and the grand strategy accompanying it, will have to evolve in response to both the changing dynamics of the American polity and the geopolitical fault lines overseas. Robert Osgood’s famous 1953 volume on Ideals and Self-Interest in America’s Foreign Relations captures post-war America’s disenchantment with foreign entanglements "heightened by the paucity of the crusade’s material and spiritual rewards in proportion to the magnificence of the idealistic hopes it had raised and the seeming enormity of its sacrifices." The ascension of President Trump thus poses a threat to the triumphalist confidence of the 21st century cosmopolitan and globalist elites. In this new world, "the power of identity politics can no longer be denied...and the necessity for those roots to find political expression in both foreign and domestic policy arenas" is a reality contemporary Hamiltonians and Wilsonians have to contend with. Apprehension of this newfound reality has incited resistance from liberal internationalists. Indeed, as Michael Anton laments, “the priesthood is protecting its guild” (emphasis added). Whilst liberal internationalists have portended a dystopian breakdown of western hegemony, others such as Kupchan offer a conception of the next turning: where the liberal order is not being universalized, "but neither is it being displaced by a new center of gravity or dominant political model." Kupchan’s image of the world is one that is multipolar –– where American hegemony no longer defines the international system. Robert Kagan, an internationalist par excellence, laments this as The Return of History and the End of Dreams. Implied in Kagan’s post-internationalist map is a return to Maachtpolitik, where "competing great powers…produced the fertile ground for the two destructive world wars." The likely result for Kagan –– "an unprecedented global calamity." Conventional internationalist wisdom holds that revolutionary powers will seek to redefine and reorganize the norms of international relations in toto. Contra Kagan, this article contends that whilst revisionist powers may seek to "chip away at the norms,” they are profoundly integrated into the liberal world order, ergo, seek only limited revisions. As Ikenberry claims, "China and Russia…are not full-scale revisionist powers but part-time spoilers at best." In this reborn geopolitical landscape, great power accommodation and maneuvering within mutual restraints is desirable. In sum, as America’s unipolar moment gives way to a more diffuse distribution of power in the international system, it becomes all the more important to herald an order, and a grand strategy that can usher in that order, to moderate great power politics. There is a compelling case for the synthesis of Jacksonian-Jeffersonian philosophy to the building blocks of contemporary US grand strategy. 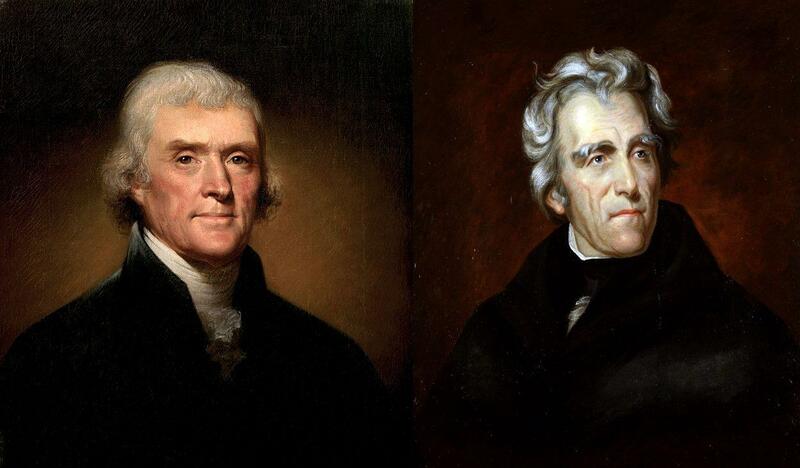 This Jacksonian-Jeffersonian philosophy, for the purposes of this article, refers to commercial republicanism and non-involvement respectively. In George Washington’s 1796 Farewell Address, the retiring president observes that America’s general rule in foreign policy should be to "[extend] commercial relations" whilst maintaining "as little political connection as possible." This line of reasoning bears the hallmarks of the "Machiavellian precept" delineated by Jackson - "collaborate with other countries when it is advantageous or necessary but avoid needless foreign entanglements." Reigning in the institutional overstretch of liberal internationalism is in keeping with a more moderate conception of US power; one that brings into balance the nation’s commitments with its resources. This pillar sets aside global engagement and liberal order building and prioritizes among other things, what Michael Anton terms "commercial republicanism" (emphasis added). The strategic imperative of this pillar is "to prevent hostile powers from…exerting undue influence on potential trading partners." A further manifestation of the Jacksonian pillar is Trump’s transactionalism: the desire to cut deals with political entities regardless of their internal character. It is also what guides (or misguides) the desire to reverse multilateral trade deals such as the Trans-Pacific Partnership and North American Free Trade Agreement, which largely represent the economic architecture of the liberal international order. The Jacksonian cynicism towards multilateralism was also on full display in Brussels earlier this year, and afterwards as President Trump eventually pulled out of the Paris climate accords. In short, for Jacksonians, the US needs to renegotiate the terms of the post-war international order to ensure its intended purpose is met –– the blessings of prosperity for the American people. The next pillar is that of Jeffersonian non-involvement. A common sentiment amongst the Founding Fathers was the notion that establishing a city upon a hill should not lead to providing those same blessings of liberty overseas. John Quincy Adams described the union as "the well-wisher to the freedom of all…but the champion only of her own." This wisdom, appreciated anew, brings to the fore the principle of state sovereignty enshrined in the 17th century Peace of Westphalia. Whilst Hamiltonians point to the divine rights of man, and the universal morality it presumes –– Jeffersonians point to the divine rights of the state, and the sovereignty to it bequeathed. Hamilton’s observation is also useful here; he argues that international commitments entered into by states bind them, and these bindings can force "mutual contributions" without ensuring "coincident benefit," adding that "[t]here is, perhaps, nothing more likely to disturb the tranquility of nations." Michael Anton applies similar logics when questioning "why is it in our strategic interest to push [NATO’s] borders ever outward? What do we gain by pledging American blood to defend places where it would take us a 48-hour airlift to mount a forlorn defense with one regiment?" It is folly to expand alliances unless they are rooted in the interest of the state. Hamilton warns that such alliance systems could entangle the nation “in all the pernicious labyrinths of European politics and wars." Reigning in the institutional overstretch of liberal internationalism is in keeping with a more moderate conception of US power; one that brings into balance the nation’s commitments with its resources. Lippmann, in his 1944 US War Aims, professes that "peace is to be had as a result of wise organization." Despite NATO having focused on distant democratic possessions since 1949 it is time for the liberal international order to reconfigure its reach towards a wiser organization, one mindful of the new currency of international affairs: the balance of power. The supreme task of states, and indeed the enduring legacy of mankind, has been that of regulating the excesses of war. As the old order disintegrates it becomes ever more important to herald in a strategy that allows for the complexity of this historical crossing. The cardinal rule of the new game is to recognize the inherent limits of ambitions in the search of an equilibrium among nations. It is this “satisfactory organization of mankind” based on power where “peace will follow.” The rules of the game call for a more honest, calculated, and selective approach to foreign policy. The cardinal rule of the new game is to recognize the inherent limits of ambitions in the search of an equilibrium among nations...The rules of the game call for a more honest, calculated, and selective approach to foreign policy. The topic of balance of power is not foreign to American strategists. US naval officer, Alfred T. Mahan, writing in his 1911 book Naval Strategy, describes the rise of German naval power and the threat it posed to the European balance. “[S]hould a naval disaster befall Great Britain,” Mahan cautions “leaving Germany master of the naval situation, the world may see again a predominant fleet backed by a predominant army, and in the hands, not of a state satiated with colonial possessions.” Three years later, the delicate European balance of power dissolved and the continent plunged into chaos. The historical record is consistent; a lasting peace among great powers can only be the result of a satisfactory organization of influence. This order faces the impact of two dangerous tendencies. The first, to borrow the Kissingerian term, are “revolutionary powers” who crusade in Napoleonic fashion in pursuit of absolute security at the expense of others. The second tendency, as theologian Reinhold Niebuhr would write, is the folly of “the children of the light,” blinded by their ideology and holding their beliefs to be self-evident truths. It seems that liberal internationalists have the trappings of the Kissingerian-Niebuhrian revolutionary children of the light. In the times ahead US foreign policy ought to be increasingly tempered by the dictates of realpolitik, relinquishing, to a degree, the universalistic rationale which has served as the backbone of internationalism. What would an American realpolitik strategy look like? In tangible policy terms this may consist of a Kissingerian détente with Russia, a reversal of NATO expansionism to abide to James Baker’s iron-clad guarantee to Gorbachev in 1990, and foregoing attempts to secure Ukraine into the Western sphere of influence –– this latest strategic blunder is quite simply “a textbook combination of both hubris and bad geopolitics.” Farther east this may require a more adroit mercantile relationship with China, foregoing the diplomatic formalities regarding human rights that often rustle the feathers of Beijing to no avail. Equally, it may require a strategy of modest balancing in step with a more assertive China. In the near-east this may involve establishing a balance of power among the regional powers, namely Turkey, Egypt, Saudi, Iran, India, and Pakistan. A realist statesman would cease calls for “Assad must go” and approach Persian Gulf politics with stern pragmatism. More importantly however, for the American people, realpolitik may unshackle desperately needed resources for domestic renewal. Jeffersonians can spare us the costly commitments of blood and treasure internationalism requires. As George Kennan reflected in his later life, “one of the first requirements of clear thinking about our part in world affairs is the recognition that we cannot be more to others than we are to ourselves –– that we cannot be a source of hope and inspiration to others against a background of resigned failure and deterioration of life here at home.” Internationalists and Neocons step-aside, realpolitik is the way forward –– America ignores this creed at its own peril. Mauni Michael Jalali is a recent graduate of the War Studies Department at King’s College London and will be returning shortly to the states to attend law school. Adam Tooze (2014) “The Deluge: The Great War, America and the Remaking of the Global Order”. Viking. Page xxv, 10-16, 45-47, 50-66. Walter Lippmann (1932) “The Stakes of Diplomacy”. Transaction Publishers. Page xiv, 20-36, 40-41, 50-55, 57-59, 70-73. Describes an “America [which] is ready to act on the belief that war is no longer a matter between two sovereign states, but a common world-problem of law and order in which every nation is immediately concerned. Walter Russell Mead (2017) “The Jacksonian Revolt: American Populism and the Liberal Order”. Foreign Affairs March/April 2017 Issue. Available at: www.foreignaffairs.com/articles/united-states/2017-01-20/jacksonian-revolt describes that whilst Hamiltonians understand the maintenance of world order "primarily in economic terms," Wilsonians believe that an appeal to values – "human rights, democratic governance, and the rule of law" offers a more concrete basis for world order. Robert Osgood (1953) “Ideals and Self-interest in America’s Foreign Relations: The Great Transformation of the Twentieth Century”. University of Chicago Press. Page 32-33, 40-41, 46-47, 50-55, 60-81. Dean Acheson (1969) “Present at the Creation: My Years in the State Department”. Norton Reissued version (1987). Page 6, 7-10, 14-21, 58-60. Daniel J. Sargent (2015) “A Superpower Transformed: The Remaking of American Foreign Relations in the 1970’s”. Oxford University Press. Page 1, 3-5. Taesuh Cha (2017), “The Return of Jacksonianism: The International Implications of the Trump Phenomenon”. The Washington Quarterly, 39(4), page 83-97. The Washington Consensus established the economic infrastructure of the post-war period. It was tailored to the Hamiltonian notion of an American commercial republic. As the first Secretary of the Treasury, Hamilton believed in the promotion of commerce as the defining characteristic of America. Ibid. Wilsonianism has two distinct tendencies, it is in essence the marriage between the lofty ideals of a society of states (See Kant’s Perpetual Peace) and the notion of an American manifest destiny. The United States, as the shining city upon a hill, ought to make its duty one of world peace through the instrument of law practiced internationally. Robert Osgood (1953) “Ideals and Self-interest in America’s Foreign Relations: The Great Transformation of the Twentieth Century”. University of Chicago Press. Page 82-86. Michael Anton, (2017) America and the Liberal International Order. American Affairs Volume I, Number 1 (Spring 2017): Page 113–25. Charles A. Kupchan. (2012), “No One’s World: The West, the Rising Rest, and the Coming Global Turn”. 1st Edition. Oxford University Press. Page x, 12-17, 30-33, 40-47. Robert Kagan. (2009), “The Return of History and the End of Dreams”. 1st Edition. Vintage Books. Page 10-12. Jackson, R. (1995) The Political Theory of International Society, in Ken Booth and Steve Smith’s "International Relations Theory Today", (Polity Press: Cambridge) pp. 116. Michael Anton (2017), “America and the Liberal International Order”. American Affairs Volume I, Number 1 (Spring 2017) Page 113–25. President Trump “The Paris climate accord is simply the latest example of Washington entering into an agreement that disadvantages the US to the exclusive benefit of other countries”. The New York Times [Online Transcript] Available at: https://www.nytimes.com/2017/06/01/climate/trump-paris-climate-agreement.html?_r=0. Accessed June 1st 2017. President Trump’s stern warning to allies in Brussels regarding the 2% budgetary commitment has a passing familiarity with President Obama’s anti-free rider campaign. Both are seemingly concerned with what is fair for the US taxpayer – the moral community is increasingly located at home rather than abroad. Curbing internationalism on the basis of domestic renewal is the underlying logic of both Obama’s classical retrenchment and Trump’s nascent nativism. The European settlements of 1648 marked the end of Europe’s religious wars. The settlement consisted of a two framework accord - the Treaty of Münster marked the cessation of hostilities between Spain and the Netherlands and the Treaty of Osnbrück ending the 30 years’ war. The diplomatic congress set a precedent: ending the scourge of war via diplomacy. State sovereignty was the basis of peace. Walter Lippmann, (1944) “US Foreign Policy and US War Aims”. 1st Edition. Overseas Edition. Page 60-64, 65-66. Walter Lippmann, (1932) “The Stakes of Diplomacy”. Transaction Publishers. Page xiv, 20-36, 40-41, 50-55, 57-59, 70-73. Alfred Thayer Mahan, (1911) “Naval Strategy”. 1st Edition. United States Marine Corps. 105-107. Henry Kissinger, (2015) “World Order: Reflections on the Character of Nations and the Course of History”. (Penguin: London) Page 20-36, 40-42, 48-56, 60-71. Revolutionary powers are states with revisionist ambitions who challenge the prevailing balance in the international system. Revolutionary powers are often guided by a sense of historical or divine purpose (i.e. Putin’s USSR, Erdogan’s Ottoman Empire, IRGC’s Persian Empire etc.). In this instance I argue liberal internationalism has a sort of cosmopolitan-puritan sense of divine purpose – acting on behalf of humanity itself. Reinhold Niebuhr, (1949) “The Children of Light and the Children of Darkness: A Vindication of Democracy and a Critique of Its Traditional Defence”. Scribner Publishers. Page 33, 115, 120-122. Liberal internationalists preside over an increasingly revolutionary foreign policy given the evolving distribution of power in the international system and yet the hubristic persistence of liberal internationalism in US grand strategy. George F. Kennan, Sketches from a Life (New York: Pantheon, 1989), Page 225-28, 350-355.